In evolutionary biology, a spandrel is a phenotypic characteristic that is a byproduct of the evolution of some other characteristic, rather than a direct product of adaptive selection. The term originated during the Roman era as an architectural word for the roughly triangular space between the tops of two adjacent arches and the ceiling. These spaces were not actually utilized until later on, when artists realized they could make designs and paint in these small areas, enhancing the overall design of the building. Stephen Jay Gould, a paleontologist at Harvard, and Richard Lewontin, a population geneticist, borrowed the word to apply to secondary byproducts of adaptations that were not necessarily adaptive in themselves. The term was coined by the Harvard paleontologist Stephen Jay Gould and population geneticist Richard Lewontin in their influential paper "The Spandrels of San Marco and the Panglossian Paradigm: A Critique of the Adaptationist Programme" (1979). In their paper, Gould and Lewontin employed the analogy of spandrels in Renaissance architecture: curved areas of masonry between arches supporting a dome that arise as a consequence of decisions about the shape of the arches and the base of the dome, rather than being designed for the artistic purposes for which they were often employed. The authors singled out properties like the necessary number of four and their specific three-dimensional shape. At the time, it was thought in the scientific community that everything an animal has developed that has a positive effect on that animal's fitness was due to natural selection or some adaptation. Gould and Lewontin proposed an alternative hypothesis: that due to adaptation and natural selection, byproducts are also formed. These byproducts of adaptations that had no real relative advantage to survival, they termed spandrels. In the biological sense, a "spandrel" or "exaptation" (as Gould and Lewontin referred to them) might result from an architectural requirement inherent in the Bauplan of an organism, or from some other constraint on adaptive evolution. Evolutionary biology uses the term spandrel for features of an organism arising as byproducts, rather than adaptations, that have no clear benefit for the organism's fitness and survival. In response to the position that spandrels are just small, unimportant byproducts, Gould and Lewontin argue that "we must not recognize that small means unimportant. Spandrels can be as prominent as primary adaptions". A main example used by Gould and Lewontin is the example of the human brain. It is explained that the human brain is the area in humans that is thought to have the most spandrels. So many secondary processes and actions come in addition to the human brain and its main functions. These secondary processes and thoughts are the spandrels of the human body, which eventually through thought and action can turn into an adaption or fitness advantage to humans. Just because something is a secondary trait or byproduct of an adaption does not mean it has no use because it may eventually be used as something beneficial to the animal. Their suggestive proposal generated a large literature of critique, which Gould characterised (Gould 1997) as being grounded in two ways. 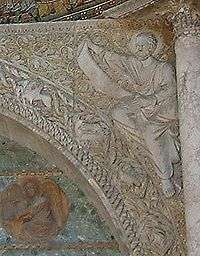 First, a terminological claim was offered that the "spandrels" of Basilica di San Marco were not spandrels at all, but rather were pendentives. Gould (1997) responded, "The term spandrel may be extended from its particular architectural use for two-dimensional byproducts to the generality of 'spaces left over', a definition that properly includes the San Marco pendentives." Other critics, such as Daniel Dennett, further claimed that these pendentives are not merely architectural by-products as Gould and Lewontin supposed. Dennett argues that alternatives to pendentives, such as corbels or squinches, would have served equally well from an architectural standpoint, but pendentives were deliberately selected due to their aesthetic value. Critics argue that Lewontin and Gould's oversight in this regard illustrates their underestimation of the pervasiveness of adaptations found in nature. Ian Kluge criticizes the whole subject of spandrels to be bogged down in a definitional debate, i.e. it is not entirely clear what is a spandrel and what isn't, and that, worse, all examples of spandrels, pendentives, corbels and squinches do actually serve a function, i.e. they are necessary to achieve something – but that necessity is exactly what epiphenomenalism denies. Gould (1991) outlines some considerations for grounds for assigning or denying a structure the status of spandrel, pointing first to the fact that a structure originating as a spandrel through primary exaptation may have been further crafted for its current utility by a suite of secondary adaptations, thus the grounds of how well crafted a structure is for a function cannot be used as grounds for assigning or denying spandrel status. The nature of the current utility of a structure also does not provide a basis for assigning or denying spandrel status, nor does he see the origin of a structure as having any relationship to the extent or vitality of a later co-opted role, but places importance on the later evolutionary meaning of a structure. This seems to imply that the design and secondary utilization of spandrels may feed back into the evolutionary process and thus determine major features of the entire structure. The grounds Gould (1997, pp. 10752–10753) does accept to have validity in assigning or denying a structure the status of spandrel are historical order and comparative anatomy. Historical order involves the use of historical evidence to determine which feature arose as a primary adaptation and which one appeared subsequently as a co-opted by-product. In the absence of historical evidence, inferences are drawn about the evolution of a structure through comparative anatomy. Evidence is obtained by comparing current examples of the structure in a cladistic context and by subsequently trying to determine a historical order from the distribution yielded by tabulation. Similarly, Pinker has dismissed music as another spandrel to the enlarged brain. Dunbar found this conclusion odd, and stated that "it falls foul of what we might refer to as the Spandrel Fallacy: 'I haven't really had time to determine empirically whether or not something has a function, so I'll conclude that it can't possibly have one.'" He devotes the chapter to two potential roles of music in evolution: "One is its role in mating and mate choice, the other is its role in social bonding." ↑ Gould, Stephen Jay; Vrba, Elizabeth S. (1982). "Exaptation — a missing term in the science of form". Paleobiology. 8 (1): 4–15. ↑ S. Pinker, How the Mind Works. Harmondsworth: Penguin. ↑ Robin Dunbar, "On the Evolutionary Function of Song and Dance," in N. Bannan (ed.) Music, Language, and Human Evolution. Oxford: O.U.P., 2012, p. 201-02. Stephen Jay Gould (1997). "The exaptive excellence of spandrels as a term and prototype" Proceedings of the National Academy of Sciences USA. 94: 10750-10755. Stephen Jay Gould (2002). The Structure of Evolutionary Theory. Belknap Press of Harvard University Press, Cambridge, Mass. Phillip Stevens Thurtle. "The G Files: Linking 'The Selfish Gene' And 'The Thinking Reed'"
Daniel Dennett (1995). Darwin's Dangerous Idea: Evolution and the Meanings of Life. Simon & Schuster. ISBN 0-684-82471-X. Marc D. Hauser, Noam Chomsky, and W. Tecumseh Fitch (2002). "The Faculty of Language: What Is It, Who Has It, and How Did It Evolve?" Science 298:1569–1579. Robert Mark (1996). "Architecture and Evolution" American Scientist (July–August): 383–389. Rudolf P. Botha (2001). How much of language, if any, came about in the same sort of way as the brooding chamber in snails? Language & Communication 21:225–243.